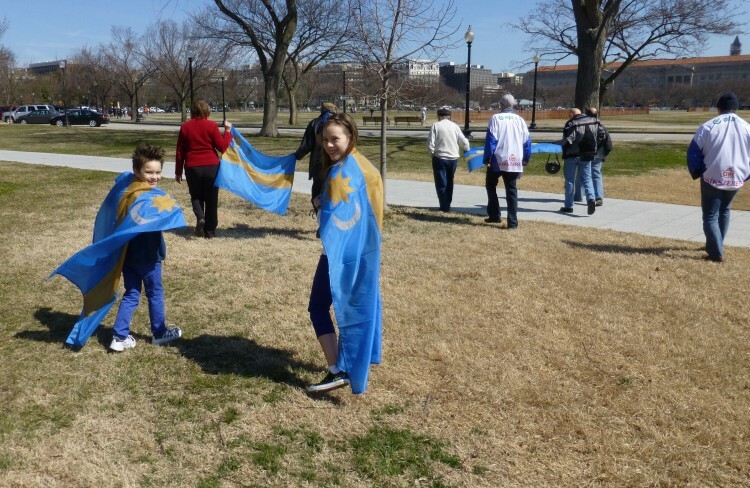 3/6/2016 -- Szekler Independence Day! AHF Leaders joined the Community to show Support for Autonomy of Rumania's ethnic-Hungarian community... 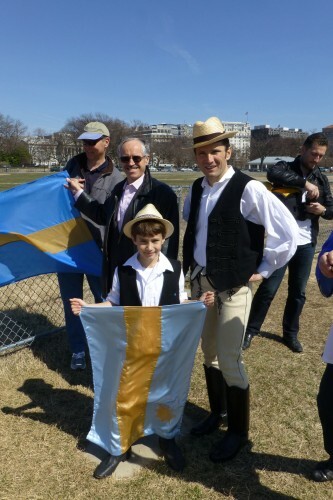 Carrying the Szekely Flag and a sign that read "Autonomy for Szekelyland," the group marched around the White House in Washington, DC, and raised awareness of the situation facing the ethnic-Hungarian community in Rumania. Numerous demonstrations were held in Europe and in North America. 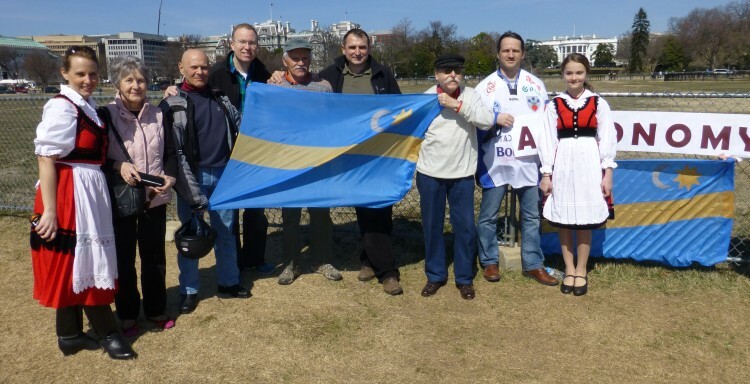 3/10/2013 -- AHF and Members of the Community show Support for Autonomy of Rumania's ethnic-Hungarian community... 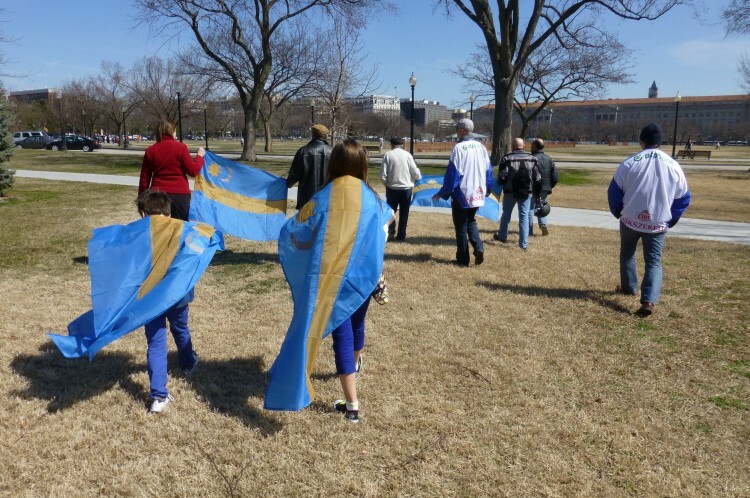 Carrying the Szekely Flag and a sign that read "Autonomy for Szekelyland," the group marched around the White House in Washington, DC, and raised awareness of the situation facing the ethnic-Hungarian community in Rumania. Numerous demonstrations were held in Europe and in North America. In 2009, Foreign Policy Review published an article (re-published in full below) by AHF President Frank Koszorus, Jr., entitled, "Autonomy: The Path to Democracy and Stability in Romania," Foreign Policy Review, volume 6 (2009)." The artcle makes a compelling case for the recognition of autonomy as a means of strengthening democracy. The article analyzes the concept of autonomy, its acceptance in various parts of Europe, why it is necessary for the Hungarian minority in Romania to be able to preserve its unique characteristics, why it is an indispensable element of liberal democracy in a state such as Romania, and how it promotes stability. It is thus especially relevant to current developments, including the Szekely flag issue and the indefensible redistricting proposals that would further reduce the ability of Hungarians to effectively participate in public affairs, especially in matters affecting them, and to enjoy their culture. Ronald S. Lauder, President of the World Jewish Congress, aptly noted, "one of the basic tenets of liberal democracy is that minority rights are protected.” It is apparent that as far as the Hungarian community in Romania is concerned, autonomy is the much-desired, legitimately demanded and democratic solution. The author, points out that since autonomy is about power sharing, it is an essential element in a country such as Romania insofar as democracy also is about power sharing. The article addresses the legitimate aspirations of the members of the Hungarian community in Romania to preserve their cultural and historical identities, reviews the background of the Hungarian historical community in Romania, discusses current international norms, and identifies different forms of successful autonomy arrangements in Europe. It recognizes the markedly different historical experiences of the United States and Central Europe and persuasively argues that the United States must nevertheless “be prudent and not only support autonomy for ethnic groups when tensions rise and threaten violence – that sends a wrong signal to the international community.” While the “European community . . . recognizes the critical role played by various autonomy arrangements to advance democracy and promote stability,” Romania unfortunately does not. Central and Eastern European states are characterized by ethnic, linguistic, religious and cultural diversity. This rich diversity extends back centuries, long before nation states as we know them today existed, as different ethnic or national groups developed their separate identity, language and unique cultural heritage. Among the challenges confronting these groups is their ability to preserve their unique identity in states, such as Romania, which have adopted the nation-state model and are inhospitable toward the concept of minority rights, including autonomy. The majority of Hungarians in Romania live in Transylvania where they make up approximately 19.3% of the population. A subgroup of Hungarians known as the Szekelys, live in a compact community in the Transylvanian Szekely Region. Hungarians also live outside of Transylvania in Bucharest, the capital of Romania, and in Moldavia, where another subgroup of Hungarians, the Csango community, can be found. In addition to the large number of ethnic Hungarians, Transylvania also counted a robust community of Saxons, or Germans, and ethnic Romanians among its inhabitants. Now that Central and Eastern Europe has been freed from the constraints of Communism, the unresolved challenge in some of the countries is how they can transition into strong and genuine democracies where the rights of all their citizens are guaranteed regardless of their national, ethnic or religious background. These groups wish not only to be free from discrimination on account of their historical and cultural heritage, but they also wish to share in the political life and decision making of the country of their citizenship and, as important, to preserve their unique characteristics. An essential element of genuine democracy that transcends the tyranny of the majority is autonomy for such ethnic or historical groups. While autonomy in the European context takes several forms, ranging from administrative autonomy to cultural autonomy, the common element is the right of the members of the group to preserve their unique cultural characteristics and exercise control over their local affairs. The latter often is a precondition to their ability to achieve their aspirations to preserve their identity. Autonomy is nothing more than a power sharing mechanism. Americans, steeped in individual liberties, tend to ignore the aspirations of people for autonomy, believing that individual rights are all that are needed to ensure democracy. This fundamental misunderstanding of a particular group’s need for autonomy can be traced to the historical development of the United States. With the exception of African Americans and Native Americans, people came to the United States voluntarily to seek the American dream. In that process, these immigrants willingly shed their past allegiances, languages and traditions to be part of the American “nation.” They wanted equal opportunities and the liberties to pursue their happiness. As a result of this attitude toward assimilation, some fail to understand why a Hungarian national who is a citizen of Romania wants to preserve his or her Hungarian culture. The difference is that those Hungarians, although loyal Romanian citizens, did not choose to become Romanians. They did not voluntarily leave their ancestral Hungarian homeland to assimilate into a Romanian culture. Rather by a stroke of a pen, other countries drew new boundaries that “transferred” Hungarian nationals to Romania. Americans should not be surprised by Romania’s Hungarian community demanding autonomy for another salient reason. If one scratches the surface, one finds ample examples of Americans exercising the right of local self-government, a form of autonomy. For example, Americans cherish their right to participate in town hall meetings and decide local matters. If these rights were to be denied them by the dictates of a highly centralized government, Americans would surely feel that an important element of their democratic traditions and governance had been taken away from them. Reference to Transylvania will be to the geographic name of the Hungarian province transferred to Romania after the First World War and then again after the Second World War. With the exception of the sixteenth and seventeenth centuries when Transylvania was under Ottoman suzerainty and the late seventeenth century until 1867 when it was a Habsburg principality, Transylvania was an organic part of the Hungarian state until the end of World War I. By the terms of the Peace Treaty of Trianon (June 4, 1920) which concluded the First World War, Hungary was forced to cede 102,093 square kilometers to Romania or 31.7 percent of pre-war Hungary and 1,704,852 ethnic Hungarians. The territory given to Romania was larger than what remained as Hungary – a state which unjustifiably had been vastly reduced by the punitive and ill-conceived treaty. Among the greatest weaknesses of the new order created by the Treaty of Trianon was that it transferred territories in violation of the ethnic principle and even denied the affected populations the right to express their preference as to whose sovereignty they would live under. Future suffering, tensions and, in some cases, conflict and violence were thereby ensured. Although the peacemakers insisted that the successor states, including Romania, sign international instruments that contained provisions for the protection of minorities, the new or enlarged states generally ignored their promises. The result was that individual and minority rights of ethnic Hungarians were violated with little or no adverse consequences to the transgressors. Romania quickly forgot these and related obligations as soon as it acquired Transylvania. Few examples will suffice. Inscriptions soon appeared that “only Romanian may be spoken” in public places. Courts heard cases only in Romanian. Official petitions could only be submitted in Romanian. The government abolished over 1,000 schools in which the language of instruction had been Hungarian. Agrarian laws discriminatorily expropriated the property of the former Szekely Frontier Guards, while they exempted the property of the descendants of Romanian frontier regiments. The Communist dictatorship in Romania dealt a particularly heavy blow to the Hungarian minority and historical community. Not only did the minority lose its communal and private properties, the successive Romanian regimes culminating in the Ceausescu dictatorship were characterized by an ultra-nationalism that waged a war against the cultural heritage of the country’s Hungarian minority. Thus, for example, use of the Hungarian language was eliminated from public life and administration. The Communist authorities closed additional Hungarian language schools. They merged the Hungarian Bolyai University into the Romanian Babes University, thereby depriving the Hungarian community of the opportunity to be educated in their mother tongue. Other steps were taken to forcibly assimilate the Hungarian historical community, such as the continuation of the policy preceding Communist rule of resettling ethnic Romanians to Transylvania and drastically changing the ethnic composition of the region. while the Romanian Constitution adopted in 1991 as amended in 2003 guarantees certain rights, such as linguistic rights, to minorities, it still refuses to accept the multi-ethnic nature of Romania by declaring that the country is a “unitary” and “national state.” EMNT has proposed that the Romanian Constitution instead define the country as “a state based on the rule of law – sovereign, independent, social, and democratic.” The Romanian political elite have rejected this sensible formulation. Instruction in the Hungarian language is critical if the Hungarian community is to preserve its identity. By the 1900s, Transylvania boasted of a highly developed education network offering instruction in the Hungarian language at every level. Since the Treaty of Trianon, the Romanian authorities gradually eliminated this network of schools as part of their policy of forcible assimilation. The demise of Communism resulted in some improvements and reversed the elimination of Hungarian language schools, especially after the 1999 education law was adopted. Hungarian language public education, and thus respect for minority rights, however, is still hampered by a number of shortcomings that await resolution. Among these is Romania’s refusal to establish Hungarian language agrarian, medicine, pharmacy, veterinary medicine and engineering schools. The authorities even refuse to re-establish the Hungarian language Bolyai University in Cluj-Napoca/Kolozsvar, which the solidly Stalinist Romanian government virtually liquidated in 1959. The liquidation and forced merger with the Romanian Babes University was implemented by the secretary of the Central Committee, Nicolae Ceausescu. As this university has yet to be restored, Nobel Laureates and Wolf Prize Laureates, including Elie Wiesel, George Olah and 69 other internationally acclaimed scholars called upon Romania on February 16, 2006 to take "immediate steps" to "re-establish the public Bolyai University in Cluj-Napoca/Kolozsvar." Not only have the Romanian authorities ignored this plea and the Hungarian minority’s request, a disturbing violation of human rights occurred in November 2006 when two Hungarian assistant professors were expelled from Babes-Bolyai University for placing parallel Hungarian inscriptions below Romanian language signs at the so-called multi-cultural institution. The expulsions occurred despite the fact that university officials had decided to allow the placement of bilingual signs by January 10, 2006. The officials stonewalled until the two assistant professors sought to implement the university’s decision. Romania has yet to fulfill its promises to its ethnic Hungarians in other areas as well. While Bucharest lavishly funds the Orthodox Church that is engaged in a church building spree, it has returned to the rightful Hungarian owners only a fraction of the more than 2000 religious and communal properties illegally seized from them during the Communist era. After the fall of Communism in 1989 and the formation of DAHR, the Hungarian community of Romania demanded autonomy in an attempt to remedy past violations of human rights. The Romanian political elite failed to respond to this legitimate demand. This demand is particularly reasonable considering the shortcomings of the Constitution and newly enacted laws to adequately guarantee the rights of the Hungarian minority or satisfactorily address other issues of considerable importance to the members of that minority, such as the return the Hungarians’ communal properties or the re-establishment of the Bolyai University. The Hungarians’ quest for autonomy is, guided by the conviction that existing practice in the states of Europe validate the practicability and viability of autonomy for communities which have historical ties to their land of birth, and which consider autonomy as the most effective means to preserve their national identity and survive as a community in their homeland. Autonomy can take several forms depending on the wishes of the people involved, the structure of the state, historical and economic factors and the commitment of the majority and political elite to democracy and tolerance of different cultures. However, the two salient characteristics of autonomy are giving a population the right to self-government while leaving certain powers to the central state and enabling an ethnic, national or cultural minority to preserve its customs, language, religion and social structure. As stated by Geza Jeszenszky, an expert on the topic and former Foreign Minister of Hungary and Ambassador to the United States, What the minority communities of Central and Eastern Europe are seeking is neither separation nor a change in borders, but the right to retain their language and culture, to have their children educated in the language of their forbears, and to have local officials and representatives chosen from their own community, who understand their way of life. This is what the much debated claim for autonomy and collective rights is all about. The first mechanism is particularly suited to the needs of the largely compact community of Hungarians of the Szekely Land who comprise over 42% of the Hungarians living in Romania. This mechanism is known as territorial autonomy which transfers powers that are exercised by locally elected representatives to a region where the minority constitutes a majority. The aim of this arrangement, as is true of other arrangements, is the preservation of the existence and cultural identity of the minority without jeopardizing the integrity of the state. The powers granted to the local authorities under the territorial autonomy arrangement include competence over matters such as education, cultural institutions, social services and local police. A second arrangement applicable to the Hungarian historical community in Romania is local self-administration with special status. Here powers are delegated to the members of a minority residing in an administrative unit – a town or city -- concerning issues of importance to the minority, such as education. Finally, the Hungarians of Romania demand personal autonomy for Hungarians who are dispersed throughout the country. Personal autonomy is self-government at the individual level which permits the members of the minority who do not live in compact communities to enjoy rights through the minority’s institutions and legislation applicable to that minority. This mechanism enables members of the minority to practice their religion or partake in unique cultural events. The Hungarians’ unequivocal and legitimate demand for autonomy has been ignored by Romania to this day. Romania not only rejects their autonomy proposals, it virtually treats such democratically asserted requests as acts of treason. For instance, on April 25, 2003 Romanian Prime Minister Adrian Nastase requested the Prosecutor-General’s Office to investigate calls for territorial autonomy made by Hungarian leaders. Similarly, the then ruling Social Democratic Party criticized SZNT, labeled its autonomy proposals as an assault against Romania’s territorial integrity and called on the authorities to initiate a criminal investigation against the organization’s founders and ban SZNT altogether. In 2007, Romanian authorities prevented an official referendum from being held that had been initiated by SZNT on the issue of the establishment of an administratively autonomous Szekely region. Thereafter, SZNT conducted an unofficial ballot, interviewing approximately 170,000 inhabitants of the region; 98% of those interviewed favored territorial autonomy. Once again several Romanian politicians called on the authorities to prosecute the organizers of the ballot. Although the Interior Minister declined to prosecute, Prime Minister Calin Popescu Tariceanu declared the voting unconstitutional and reaffirmed that Romanian law does not provide for autonomy on ethnic grounds. In addition to being an essential element of democracy in a country such as Romania, autonomy reduces tensions and forestalls violence, tensions and violence that are caused by, the inadequate application of democracy, by unwillingness on the part of some governments to meet the aspirations of their minority national or ethnic groups, which have so far been unable to assume responsibility for running their own affairs, and so to ensure their future for generations to come. It is not the assertion of internationally recognized rights, but the denial of them that causes the troubles surrounding the issue of national minorities in Central and Eastern Europe. The tensions arise because some governments, identifying the state with only the dominant national community, tend to muzzle and suppress the efforts of the minority communities aiming at preserving their very identity. This policy is . . . currently being pursued in many cases by people whose mentality was deformed under communism, and who have not been exposed to the enlightened and tolerant spirit that prevails in the Western countries at least since the second World War. Such a policy is often a weapon used by people who belong to the old nomenklatura. They are bent on preserving their power by harnessing nationalism and turning the minorities into scapegoats, just like the Jews were in many countries in the past. Recognizing the resurgence of tensions which frequently are “the product of unresolved conflicts within states,” the Council of Europe resolved that states must prevent such tensions by introducing flexible constitutional or legislative arrangements to meet minorities’ expectations. . . . Autonomy, as applied in states respectful of the rule of law which guarantee their nationals fundamental rights and freedoms, should rather be seen as a ‘sub-state arrangement,’ which allows a minority within a state to exercise its rights and preserve its cultural identity, while providing certain guarantees of the states’ unity, sovereignty and territorial integrity. The European community, thus, recognizes the critical role played by various autonomy arrangements to advance democracy and promote stability. Romania does not. As noted above, Romania rejects the Hungarian minority’s plans for autonomy claiming that they are “anti-democratic and anti-European.” Yet, it is precisely European norms and practices that Romania ought to adopt and respect to promote genuine democracy. Europe has grappled with the codification and the definition of the rights of national minorities. While that process is far from complete, European states, especially the mature democracies, have accommodated their minorities by granting them various degrees of autonomy. Indeed, as there are a variety of historical, cultural and socio-economic circumstances affecting different minority groups, there are a number of autonomy arrangements that address the minorities’ requirements for political self-administration and cultural preservation. An example is Gagauzia, Moldova’s autonomous region. Gagauzians enjoy internal self-determination with an Assembly whose powers and jurisdiction include the regulation of education, culture, local development, budget and taxation, social security, and urban planning and environment. Gagauzians’ rights are far reaching, as their Assembly may even challenge national laws in court if they impinge on Gagauzian jurisdiction. In response to the Gagauzians’ anxiety that their territory may be annexed to Romania as it was in 1918 – 1940 and 1941 – 1944, the legislation establishing the autonomous region permits the Gagauzians to secede and establish their own state if Moldova changes its status as an independent state. One observer commented that the “autonomy of Moldova’s Gagauz Yeri is of paramount importance for Central and Eastern Europe,” as it set an example that territorial autonomy “can offer a sensible remedy to concerns” of all sides. Other examples of working autonomies include but are not limited to the significant degree of self-government enjoyed by Catalonia and the Basque country in Spain; the elected assemblies and governments of Scotland and Wales in Britain; and the autonomy granted to the German-speaking population of South Tyrol. It is also worthwhile to compare the enlightened policy of Finland toward its small Swedish minority with the restrictive and intolerant policies of Romania toward its larger Hungarian community. Although only comprising 5.8% of the population, Finland’s Constitution declares both Finnish and Swedish as the official languages of the country and provides for the equality of rights of both languages. The Constitution also guarantees the right of all citizens to use their mother tongue in any official governmental interaction or public administration. All laws of Finland are required to be published in both languages. As a result, the Swedish community has its own public education system in which Swedish is the language of instruction. All Finnish citizens have the right to receive education in their mother tongue from kindergarten through the university level. The parents have the right to choose the language of the education for their children. Unlike Romania which refuses to restore the Hungarian language Bolyai University, Finland has a university in which the language of instruction is Swedish even though the city in which the university is located, Turku/Abo, has a Swedish population of only 5%. All of these successful models are tailored to the unique circumstances of the minorities involved. The common element, however, is a willingness of the majority to compromise with the minority, share power and enable the members of the minority to protect their culture and identity and govern themselves, at least on the cultural and local level. From the very birth of the United States, Americans have stressed individual rights and the concept of one nation, as opposed to many nations sharing a common citizenship. Thus, the Polish-American is as much part of the American nation as is the Vietnamese-American. This concept of a melting pot is reflected in the motto appearing on the Great Seal of the United States and coins, E Pluribus Unum or “Out of Many, One. The predilection for individual rights can be explained not only because of Western political thought and theory, but also because America is a country of immigrants. Despite this history and reluctance by the United States to support collective rights, Americans nevertheless recognize group rights in discrete instances. For instance, labor unions are granted collective bargaining rights; Native Americans are granted rights not accorded to other groups; and the Amish community has been extended accommodations in their locality. Moreover, the United States has on occasion diplomatically supported autonomy, a group right, in international affairs, as it did in 1995 when U.S. envoy Richard Holbrooke skillfully devised the Dayton accords, ending a bloody war in the Balkans. Those accords divided Bosnia into Serb and Croat-Muslim entities, each enjoying a considerable degree of autonomy. Still, Dayton is the exception not the rule. U.S. reluctance to support the legitimate and democratically expressed aspirations of Romania’s Hungarian minority for autonomy is somewhat puzzling considering that Americans have long been suspicious of strong centralized power, which they believe threatens liberty. This suspicion has resulted in the adoption of federalism, which divides governmental power, and is enshrined in the Constitution. Federalism is power sharing and fundamental to the American political system. Indeed, Americans insist on maintaining control over local matters that affect their everyday lives, such as education, zoning, hospitals and police. And the reality is that while Americans do share common values and preserve common or national rights, such as a right to a jury trial, as a country of immigrants, the various ethnic and religious groups bring unique cultural values to these shores that are accommodated by federalism and local units of government. In other words, localism or local self-government is an entrenched value that has strengthened American democracy. Romania is now a member of NATO and the European Union. Its security and reintegration into Western institutions are assured. While not yet a mature democracy, Romania nevertheless has had ample time to convert its commitments into deeds by adopting and implementing tolerant policies toward the Hungarian minority. The United States, with its interest in promoting democracy and stability in Central and Eastern Europe and respect for local self-government, federalism and human rights, has a special role to play in encouraging Romania to recognize and grant the Hungarian community’s legitimate and democratically expressed aspirations for autonomy. The United States should be prudent and not only support autonomy for ethnic groups when tensions rise and threaten violence – that sends a wrong signal to the international community. Denial of autonomy can lead to Kosovos. Interestingly, the United States quickly recognized Kosovo’s independence in 2008. The Hungarians of Romania are seeking much less than the status of a Kosovo. Under these circumstances, the United States ought to support the Hungarian community’s efforts in Romania for autonomy within existing borders, efforts that are being pursued consistent with the rule of law, parliamentary procedure and democracy. *Mr. Koszorus, is an attorney in Washington, D.C. He has lectured and written about minority rights, coauthored (with Csaba K. Zoltani) “Group Rights Defuse Tensions,” The Fletcher Forum of World Affairs (1996), and was a Study Group participant in a Carnegie Endowment for International Peace project which culminated in a book on self-determination. Mr. Koszorus was appointed a public member of the U.S. delegation to the Paris meeting of the CSCE Conference on the Human Dimension. 1. Bryan Cartledge, The Will to Survive: A History of Hungary (Timewell Press, 2006), p. 340. 2. The Treaty of Trianon following the First World War was arguably the most severe of all the post-World War I settlements. Ostensibly in the name of national self-determination, the Treaty dismembered the thousand-year-old Kingdom of Hungary, a self-contained, geographically and economically coherent and durable formation in the Carpathian Basin and boasting the longest lasting historical borders in Europe. It was imposed on Hungary without any negotiation by leaders who were ignorant or ignored the region’s history. Bryan Cartledge, Mihaly Karolyi and Istvan Bethlen: Hungary (Haus Publishing LTD 2009), pp. 67 – 80 and 91 – 106. 3. On May 31, 1919, President Woodrow Wilson noted at the Paris Peace Conference that, “Nothing . . . is more likely to disturb the peace of the world than the treatment which might in certain circumstances be meted out to the minorities.” Cited in Adatci Report, League of Nations, Official Journal, Special Supplement, 73, (1929), p. 12. Eighty years later, the former chairman of the National Intelligence Council at the CIA observed: “We are talking about . . . the willingness of minorities . . . to put up with gross misgovernance in a world rife with talk of democratization, globalization, civil society, nongovernmental organizations, human rights and growing U.N. norms. How long can we expect that minorities will indefinitely accept unacceptable status quos? Graham Fuller, “More Kosovos,” The Washington Post, (May 4, 1999), p. A 23. 4. The effect of the xenophobic and discriminatory practices on the Hungarians is evident from the demographic changes in the region. For example, when Transylvania was transferred to Romania, the Hungarian population was 1,704,852. According to the 2002 census, the Hungarian population is 1,434,377. The percentage of Hungarians living in Transylvania sharply declined as follows: 1910 31.6%; and 1997 19.3%. Karoly Kocsis and Eszter Hodosi-Kocsis, Ethnic Geography of the Hungarian Minorities in the Carpathian Basin (Hungarian Academy of Sciences: Budapest, 1998), p. 113. 5. Not even these restrictive constitutional definitions should preclude autonomy for the Hungarian community. Great Britain is a “unitary state,” but has nonetheless devolved power to Northern Ireland, Scotland and Wales. Nevertheless, the Romanian Constitution, among other things, is invoked to block autonomy for the Hungarians. 6. The letter was addressed to Jose Manuel Barroso, President of the European Commission, Traian Basescu, President of Romania and Calin Popescu-Tariceanu, Prime Minister of Romania. It states: “Your Excellencies, fifteen years ago, when the revolution in 1989 demolished Nicolae Ceausescu’s dictatorship, a group of intellectuals expressed their concern about academic freedom and minority rights in Romania: they demanded the restoration of the Hungarian-language Bolyai University in Cluj-Napoca/Kolozsvar. Now, the appeal is repeated because no progress has been made in achieving this aim. 7. This Hungarian-language university existed in Romania from 1945 till 1959 and its planned liquidation, by forcefully assimilating it into the mainly Romanian Babes-Bolyai university, was one of Ceausescu’s personal political triumphs. Over the last fifteen years coequality in higher education could not be achieved and it is clear that the present structure does not serve the adequate training of Hungarian professionals in Romania. Although two private universities in Transylvania are sustained by the Hungarian government, Hungarians in Romania are heavily underrepresented in higher education. 8. There are successful examples of higher education in minority languages in Europe and elsewhere – e.g., Albanians in Macedonia, Catalans in Spain, Gagauz in Moldavia, Hungarians in Slovakia, Sami in Norway, and Swedes in Finland who enjoy the benefits of a public (state-financed) university or universities in their own languages. 10. Declaration of the Hungarian National Council of Transylvania Regarding Self-Government for the Hungarian Minority in Transylvania, Cluj/Kolozsvar, December 13, 2003. 11. Geza Jeszenszky, “More Bosnias? National and Ethnic Tensions in the Post-Communist World,” East European Quarterly, 31 (1997), No. 3, pp. 283 – 299. 12. See, e.g., EMNT’s Declaration Regarding Self-Government for the Hungarian Minority in Transylvania, Kolozsvar/Cluj, December 13, 2003. 13. See April 21 2006 letter from Bishop Laszlo Tokes to Olli Rehn, Commissioner for Enlargement (EU), and Michael Leigh, Director of Enlargement (EU). 14. See MINELRES: Romania: Ethnic Minority Briefs No. 54. See Mediafax, October 10, 2003. 15. See Hungarian president calls for increased autonomy for ethnic Hungarians in Romania, Associated Press, February 12, 2007. Stefan Wolff (University of Bath), BBC News, “Europe’s autonomy solutions,” January 21, 2005. 16. Presentation by Andreas Gross, Council of Europe Rapporteur, “Autonomy and Integration,” International Conference on the Future of Self-Governance organized by EMNT and Pro Minoritate Foundation, Sovata/Szovata, Romania, April 1-2, 2004. 20. Jeszenszky, op cit. Such arrangements to satisfy the legitimate aspirations of minorities may also help diminish the manipulation of minorities by large powers to advance their aggressive designs against weaker neighbors, as Russia did in August 2008 when it invaded Georgia on the pretext of protecting South Ossetians and Abkhazians. 22. For example, Paragraph 35 of the 1990 Declaration of the Organization for Security and Cooperation in Europe provides, in pertinent part, that the participating states “note the efforts undertaken to protect and create conditions for the promotion of the ethnic, cultural, linguistic and religious identity of certain national minorities by establishing, as one of the possible means to achieve these aims, appropriate local or autonomous administrations corresponding to the specific historical and territorial circumstances of such minorities and in accordance with the policies of the State concerned.” See also, Article 11 of Recommendation 1201 of the Council of Europe’s Parliamentary Assembly, which states that in “the regions where they are in a majority the persons belonging to a national minority shall have the right to have at their disposal appropriate local or autonomous authorities or to have a special status, matching the specific historical and territorial situation and in accordance with the domestic legislation of the state.” Regrettably the Framework Convention, adopted two years after Recommendation 1201, fails to mention territorial autonomy. European organizations, however, now view the principle that members of national minorities have a right to effective participation in matters affecting them “as the most promising avenue for the ongoing development of international norms on minority rights.” Will Kymlicka, “National Minorities in Postcommunist Europe,” Ethnic Politics After Communism, eds. Zoltan Barany and Robert G. Moser (Ithaca: Cornell University Press 2005), p. 215. 23. Thomas Benedikter, “The working autonomies in Europe: Territorial autonomy as a means of minority protection and conflict solution in the European experience – An overview and schematic comparison,” Society for Threatened People, Bolzano/Bolzen, June 19, 2006, http://www.gfbv.it/3dossier/eu-min/autonomy.html. 24. Even France, which has been reluctant to recognize linguistic diversity, is beginning to exhibit a little more flexibility. In May 2008, the National Assembly proposed an amendment to the Constitution that would recognize regional languages as being part of France’s heritage. 25. For a discussion about how group rights flow from individual rights, see Csaba K. Zoltani and Frank Koszorus, Jr., “Group Rights Defuse Tensions,” The Fletcher Forum of World Affairs, (Summer/Fall 1996), pp. 132-146. 26. Bennett Kovrig, “Partitioned Nation: Hungarian Minorities in Central Europe,” in Michael Mandelbaum, ed., The New European Diasporas: National Minorities and Conflict in Eastern Europe (New York: Council on Foreign Relations Press, 2000), p.68. Supporters sing the Székely National Anthem [click to watch] or [read the lyrics] below in Hungarian.